Urban Geometric Distressed White Coconut Chips Stool Ottoman by Crafted Home at Indsight. Hurry! Limited time offer. Offer valid only while supplies last. This round stool is made entirely of white coconut chips. The stool features a circular design all around the surface, creating a unique illusion. This round stool is made entirely of white coconut chips. The stool features a circular design all around the surface, creating a unique illusion. This stool can be placed in any living space to add a cool modern contemporary touch. This transitional stool will bring style and design to your home. This elegant furniture features a distressed off-white wood finish. 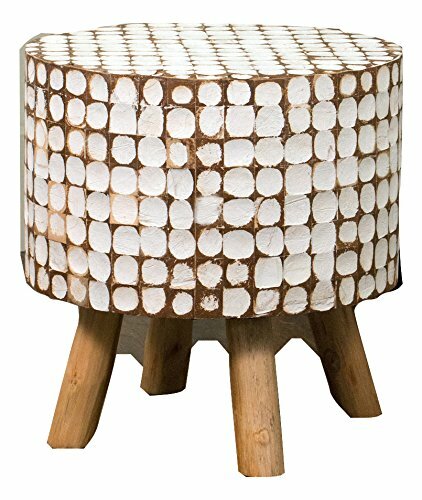 This elegant spool-like ottoman stool features natural coconut chips that form a modern geometric design. This geometric design ottoman creates a beautiful pattern and a casual place to sit. They feature four teak wooden legs to provide comfort as a footstool or impromptu seating. Perfect for rustic, or urban vintage decors, this ottoman adds interest and a warm look to your home. Dimensions: 16" L x 16" W x 16" H.
If you have any questions about this product by Crafted Home, contact us by completing and submitting the form below. If you are looking for a specif part number, please include it with your message.